Nevada Geothermal-the first geothermal power developer to receive funding under the Obama Administration's Stimulus Program-is finding the state of Nevada to be fertile ground for power projects. 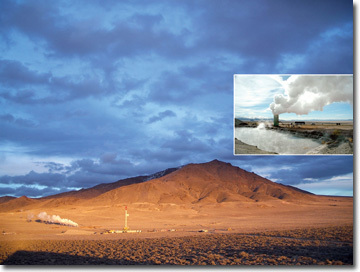 Nevada Geothermal Power Inc. recently became the first developer from the geothermal sector to receive financial support from the American Reinvestment and Recovery Act, as money started flowing as a result of the Obama Administration's promise to offer tangible support to expand America's alternative energy capacity. And that capital is helping to fuel an aggressive power production program. Nevada Geothermal Power began producing power at its Blue Mountain geothermal plant in Humboldt County in northern Nevada this past October. The plant is currently operating at a net output of 39.5 megawatts and is selling power as part of its 20-year supply agreement to Nevada and California power utility, NV Energy. Nevada Geothermal Power received a $57.9 million government grant to help pay for the $250 million project. Brian Fairbank, company president and CEO, says there are two benefits to developers from this program over the production tax credit that this program is temporarily replacing. First, it is not a discretionary program, meaning that if a company fills out its grant application correctly and spends the money, it will receive a grant. "They are going to give you the money and, because you already have the plant built, this is not a risk situation for them," says Fairbank. "You have to get your numbers audited with an independent accountant and have your plant certified by an independent engineer. That is what gives them the comfort that you are actually done." Secondly, while the production tax credit program could actually amount to more money over time, the current grant structure puts "cash in the jeans," says Fairbank. "It's a bird in the hand, so it's a very, very strong program comparatively. I think it certainly helps with the economics." While Blue Mountain is Nevada Geothermal Power's first operating plant, the company has been active in acquiring potential development properties in Nevada since the mid-1990s, focusing on higher temperature formations in excess of 150 degrees Celsius. Having been active in the industry and in the area for that amount of time, Fairbank says the company believes it has acquired many of the best potential high temperature geothermal development sites in Nevada as well as one property in Oregon. In addition to Blue Mountain, the company has development plans for its Pumpernickel site in north central Nevada; its Black Warrior site, which takes in part of Nevada's Washoe and Churchill counties; and the Crump Geyser in the Warner Valley in southern Oregon. Once fully developed, the company's cumulative generation capacity will be over 200 megawatts, or enough green energy to meet the annual demand of 200,000 homes. Fairbank says there are many reasons for the considerable interest in alternative power development from geothermal, at the present time. Geothermal is considered a base load type of clean energy, meaning that it is available 24/7. He adds that, in terms of electricity delivered to the grid, geothermal is the least expensive, compared to solar and wind. Thirdly, senior institutions and banks are now much more aware of geothermal's potential as an alternative energy source. "I think that has changed over the last few years, so there is a tremendous amount of money that would be available to the geothermal industry for the right kind of companies," he says. "There is a lot of worldwide interest in geothermal, and I wouldn't say that was commonplace even five or six years ago. But there is certainly a move toward clean energy." After a competitive bidding process, Nevada Geothermal chose Ormat Technologies Inc. as its primary equipment supplier, designer, and construction contractor for the Blue Mountain project. Nevada and California, each with substantial geothermal resources, also have the most aggressive renewable energy portfolio standards in the western U.S. Nevada is aiming for 25 percent while California has a target of 33 percent. Fairbank says having that standard certainly helps attract investment, but Nevada Geothermal Power has chosen to concentrate its activities primarily in Nevada. Although geothermal is a very clean technology, he says developers sometimes encounter quite a hostile environment in California from surrounding residents in attractive development areas such as the Imperial Valley. Also, development in California typically takes longer because of the regulatory and institutional maze. "We went into Nevada intentionally because, although we operate under the same rules since we are talking about federal land most of the time, there is not the same opposition to development in our area of Nevada as there is in some other states," says Fairbank. "Nevada is interested in jobs and creating a clean industry." The state is focused on attracting the industry's head offices as well as the service providers, such as drilling companies. Despite being a high temperature formation, there is no discharge of non-condensed gases into the air from the Blue Mountain plant, which sometimes occurs at other high temperature geothermal sites. 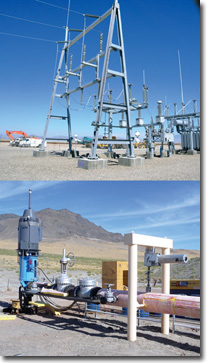 That's because Nevada Geothermal Energy has chosen binary technology to convert its geothermal energy into power at this site. What happens is that the superheated water from the underground formation, which is between 180 to 185 degrees Celsius, passes through a heat exchanger, with the water's heat used to vaporize a secondary fluid called isopentane. The isopentane gas is what drives the power generators at Blue Mountain. Isopentane vaporizes at a much lower temperature, so this method is considered a more efficient way to use the heat to generate power from geothermal sources. 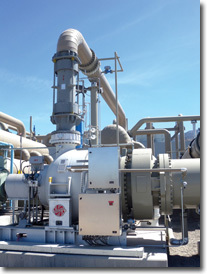 In addition to operating essentially a closed loop binary system, Nevada Geothermal Power has also been fortunate enough to have negotiated a water supply agreement with the state, which allows them to operate a water-cooled plant instead of an air-cooled plant. This is an important design element, considering how hot the desert air can get in summer. It means that the plant can produce about the same amount of power in summer as in winter, which is a high load time of year in the desert. The plant is able to use water to cool the isopentane vapor in its condenser back to a liquid. Plants that are air-cooled have their output cut by about half in summer because the hot desert air doesn't work as well to cool and liquefy vaporized gas in these conditions. "We are selling more power in the summer months, so that goes right to our bottom line," says Fairbank. Finally, with a binary system, the company is re-injecting 100 percent of the formation water, whereas only about 70 percent of the water is re-injected when the superheated water is used as the primary driver for power turbines, as is the case in some other plants. The issue of releasing non-condensed gases into the air also arises in that circumstance, but not with a binary system. After a competitive bidding process, the company chose Ormat Technologies Inc. as its primary equipment supplier, designer, and construction contractor for Blue Mountain. "We felt that they had the most advanced technology for binary plants, and they had the most experience in recent times with the construction," says Fairbank, "They also were able to provide a guarantee on both the output and timetable, which was important for us to acquire the financing that we needed to build the plant." In future, Nevada Geothermal Power will evaluate the appropriate technology for each of its other sites on a case-by-case basis and intends to continue to use a competitive bidding process to choose its primary equipment suppliers to help keep costs in line. The well drilling contractors at Blue Mountain were ThermaSource and Ensign. The piping contractor was a company called JFMPE. GeothermEx Inc. did the reservoir engineering. While greenfield development often attracts the headlines, what developers and investors often consider is the potential for expansion at existing facilities, and Blue Mountain certainly fits into that category. "We feel that instead of producing 39.5 or 40 megawatts net, we are going to be able to produce 47 megawatts, or thereabouts, net from the plant," says Fairbank. This will be achieved without any manipulation of the reservoir, but rather through what he called 'tweaking' in the production process. It starts with ensuring that the production wells are producing at their optimum rate. They are also pushing the temperature differentiation on the heat exchangers to higher than their original design. Increasing the number of production wells from five to six also reduces the draw down rate on the reservoir per well, and increasing the number of injection wells also improves efficiency. The company's engineers believe that, once fully developed, the formation could yield as much as 100 megawatts, although that is yet to be proven through a drilling program. Right now, Blue Mountain is operating with three Ormat units. Because the controls are operated from a central area, Fairbank says they believe they could install another three units without increasing their complement of 14 staff members. "I think that there is a very strong opportunity to double the size of output there," says Fairbank. The company built extra capacity into the 21-mile power line it constructed to connect to the grid, with that extra production potential in mind. Part of Nevada Geothermal Power's strategy has been to attract experienced individuals to the company, which hasn't been an easy task given how little geothermal development occurred in the 1970s and 1980s. These individuals are mentoring a new crop of technical experts entering the industry, and over the past three years of designing and building the Blue Mountain facility, the company has internally developed invaluable knowledge of dealing with the regulatory and construction process. "One of the strong assets that the company has is the talent that we have developed through that process," says Fairbank. "I think, also, that having done that once, we kind of have a template now that we can use for subsequent developments. So it is extremely advantageous to have that recent experience." The company's Pumpernickel site in Nevada and Crump site in Oregon are both ready for development drilling now.